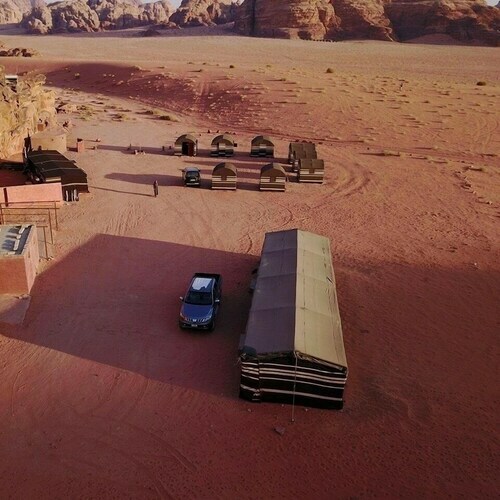 Situated in Wadi Rum, this campground is close to Mushroom Rock and Burdah Rock Bridge. 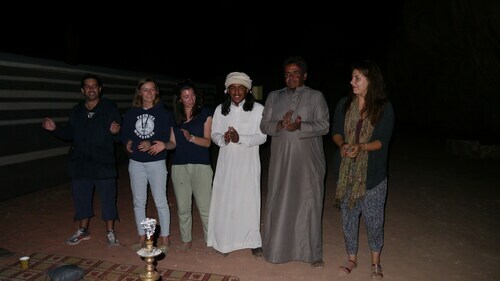 Area attractions also include Wadi Rum Protected Area and Khazali Canyon. 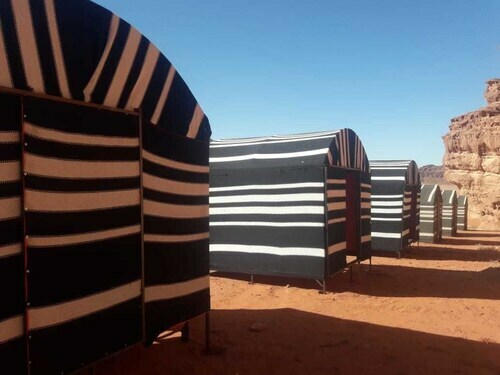 Situated on the boardwalk, this campground is 0.1 mi (0.1 km) from Mushroom Rock and 3 mi (4.8 km) from Wadi Rum Protected Area. Lawrence's Spring is 3 mi (4.8 km) away. 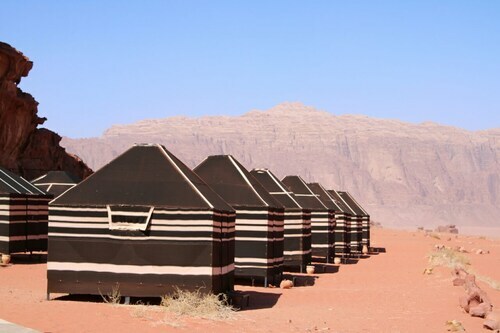 Situated in Wadi Rum, this property is close to Khazali Canyon and Wadi Rum Protected Area. Area attractions also include Mushroom Rock and Lawrence's Spring. 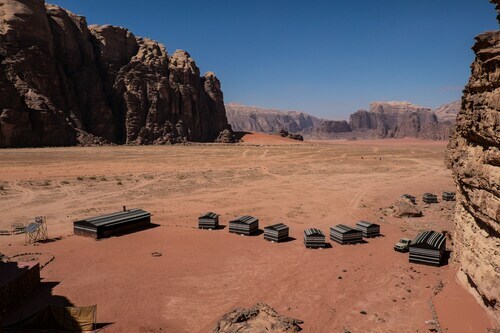 Situated in Wadi Rum, this campground is 0.1 mi (0.2 km) from Mushroom Rock and 2.9 mi (4.6 km) from Wadi Rum Protected Area. Lawrence's Spring and Khazali Canyon are also within 3 mi (5 km). Situated in the mountains, this tentalow is within 6 mi (10 km) of Lawrence's Spring, Khazali Canyon, and Mushroom Rock. 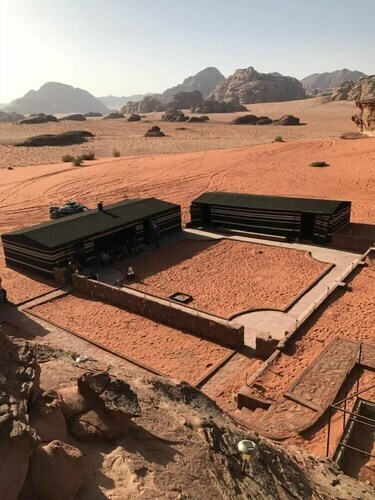 Situated in Wadi Rum, this lodge is 2.2 mi (3.6 km) from Wadi Rum Protected Area and within 6 mi (10 km) of Lawrence's Spring and Khazali Canyon. Wadi Rum Visitor Center and Mushroom Rock are also within 12 mi (20 km). 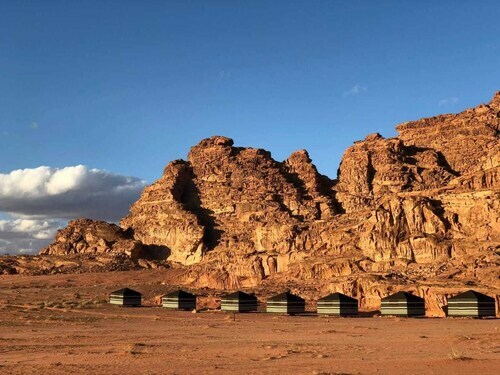 Situated in Wadi Rum, this campground is 1 mi (1.6 km) from Mushroom Rock and within 3 mi (5 km) of Lawrence's Spring and Khazali Canyon. 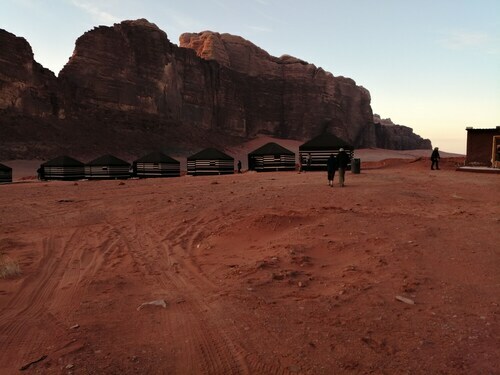 Situated in Wadi Rum, this campground is 1 mi (1.6 km) from Mushroom Rock and 2 mi (3.3 km) from Wadi Rum Protected Area. Lawrence's Spring and Khazali Canyon are also within 3 mi (5 km). 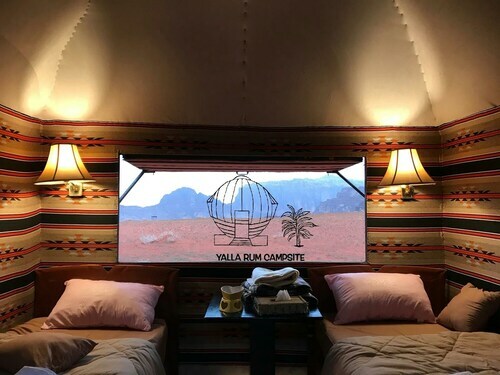 Situated in Wadi Rum, this campground is 2.5 mi (4.1 km) from Wadi Rum Protected Area and within 6 mi (10 km) of Lawrence's Spring and Khazali Canyon. Mushroom Rock is 5.5 mi (8.9 km) away. Leave your phone in the glove compartment and enjoy a break away from the trappings of the modern world at Burdah Rock Bridge. 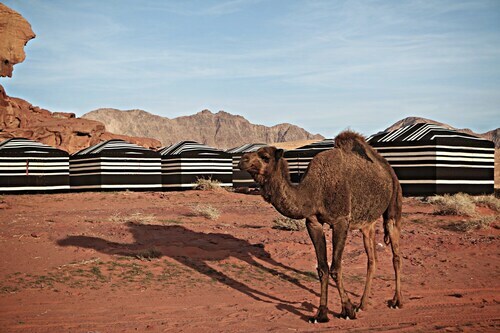 You'll discover the attraction in Wadi Rum, 170 miles (274 kilometers) away from Amman, the country's capital. Even though there aren't any accommodations in the immediate vicinity, there are more than enough in the wider area. Aqaba is just 30 miles (48 kilometers) away and has 20 places ready to take you in. Three that you might like to consider are the Kempinski Hotel Aqaba Red Sea, InterContinental Resort Aqaba and Movenpick Resort & Residences Aqaba. If you are captivated by beautiful rugged landscapes, plan a trip to Khazali Canyon. Hiking paths and numerous sights are waiting to be discovered, so be sure to pack a snack and your camera! Head to Wadi Rum Visitor Center if you have any questions. Grab valuable maps and brochures that are certain to help you enjoy your vacation. Shop 'til you drop at Aqaba City Center Shopping Mall, a favorite retail destination for tourists and locals alike. How Much is a Hotel Room in Burdah Rock Bridge? 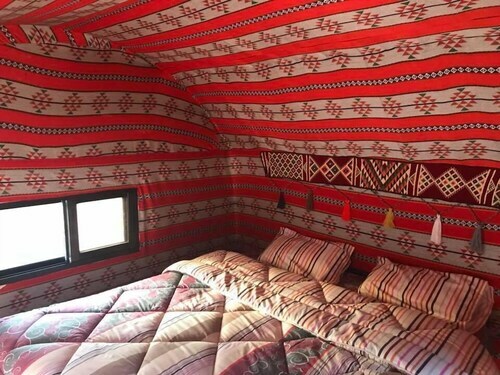 Hotels in Burdah Rock Bridge start at $18 per night. Prices and availability subject to change. Additional terms may apply.